Knowing the properties, benefits and applications for decorative surfacing materials will help you work with customers to make a wise choice. 3-D laminates are formable overlays available in solid colors, metallics and prints. 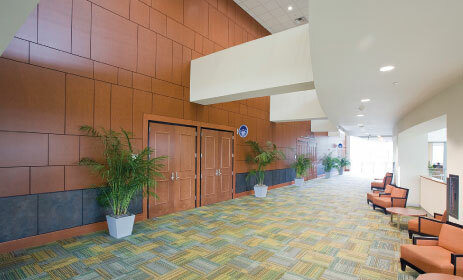 High-pressure laminates are a colorful and practical surface material for heavily trafficked areas. Here are definitions of the six most popular materials in terms that are friendly to designers and consumers. Particleboard and MDF maximize the use of wood fiber left behind by other manufacturing processes from lumber mills, plywood plants and furniture fabrication. This is material that would otherwise be landfilled or burned. By volume, these panels consist of mostly reclaimed wood fiber ‚ more than 90 percent by volume. Particleboard, as the name implies, is made up of small wood particles or chips bound together by any of several different resin systems, under heat and pressure. In MDF, the wood chips are further refined down to cellulosic fibers, producing a panel with a smoother surface and a more homogenous core than particleboard. One of the most familiar and widely used decorative surfaces, high-pressure laminate was first made famous by Formica. HPL is typically constructed of several layers of kraft paper, a layer of dÃ©cor paper with a solid color or printed design, and topped with a protective wear layer that can also carry printed design accents or other inclusions. Often specified for high-use applications like commercial counters, desktops and commercial laminate flooring. A mainstay in healthcare, hospitality, office furniture, retail and other commercial applications. Popular for residential counters and tabletops. Very durable and available with special performance properties, including chemical-, fire- and wear-resistance. Special postforming grades are available with degrees of flexibility that can wrap around columns and curved fronts. HPL can easily carry a thin metal foil decorative surface, replacing steel, aluminum, brass and other solid metals. Thermally fused melamine panels utilize a dÃ©cor layer similar to that used in HPL, but instead of being laminated to layers of kraft paper, it is pressed directly onto a substrate like particleboard or MDF. 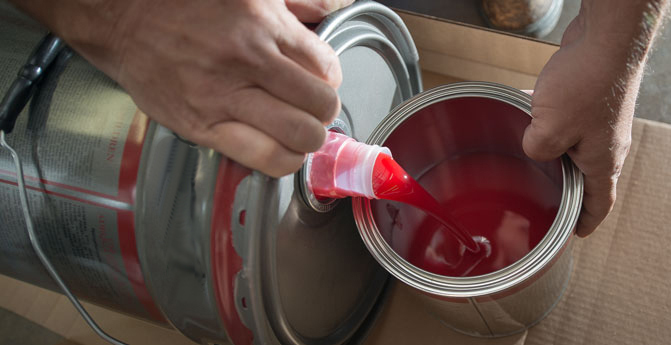 Under heat and pressure, the melamine resin from the dÃ©cor layer flows into the substrate to create a crosslinked thermoset bond, effectively creating a homogenous decorative panel without the use of adhesives. Some TFM products also carry the same type of wear layer as HPL and can be embossed to mimic stone, wood and other materials. TFM panels are popular for cabinetry, laminate flooring, furniture and closet systems. Mid-market office furniture producers commonly use TFM. It has even been used for removable decorative wall systems in commercial and retail settings. TFM is available in hundreds of colors, designs and surface textures. It is increasingly used as an economical and durable substitute for veneered panels in architectural projects. TFM compares favorably to HPL in many wear and performance measurements, although HPL offers higher impact resistance and postformability. As a furniture surface, TFM panels and components require a decorative edge treatment. TFM panels can be specified with or without edge and opposite-side face treatments, so they arrive at the job site ready to install. Many furniture manufacturers say that because TFM panels are essentially a homogenous product made from paper and wood fiber, they are more easily recycled. 3-D laminates, also known as rigid thermoformable (RTF) foils, are created from calendered PVC or polyethylene polymers. They are available in solid colors, metallics and printed designs and can be specified in a variety of surface textures, including realistic woodgrain ticking and high-gloss. 3-D laminates with enhanced wear-, stain- and chemical-resistant properties are available from several suppliers. 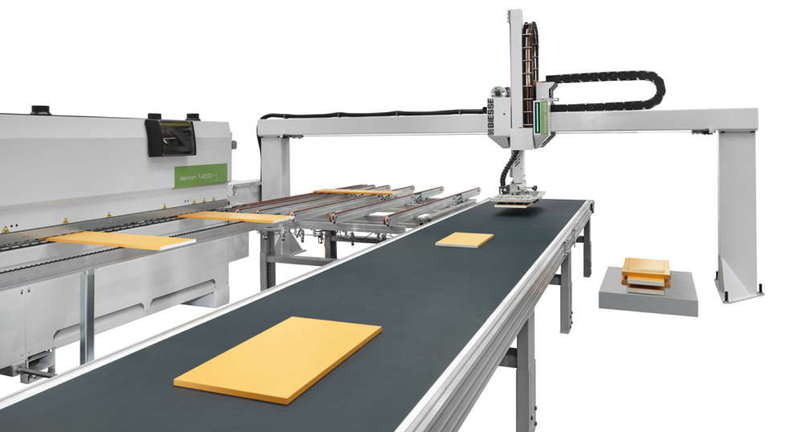 3-D laminates are unique, in that they can be laminated to panels ‚ primarily MDF because of its smoothness and core material consistency ‚ with 3-D details machined into their faces, as well as unconventionally shaped panels and panel edges. processing steps and helps seal the panel core from moisture and bacteria. This ability also helps create “soft” edge shapes that mimic shaped solid wood or stone. 3-D laminates are often used on panels with a TFM back in matching designs. Overlays offer a wide range of performance properties, including chemical- and wear-resistance. The use of 3-D laminates has grown in recent years as the office furniture industry has embraced nonstandard and organic shapes for worktops. They also are increasingly being specified for store fixtures and POP displays. In addition, they are finding wider acceptance in healthcare applications, where improved surface resistance to cleaning chemicals and their ability to seal the panel core against moisture and bacteria without seams provide a competitive advantage over other material options. The growing trend towards high-gloss surfaces is being answered by a material known as ABS foil. Acrylic-capped ABS is a durable, easy-to-laminate and cost-effective alternative to high-gloss finishing lines. Panels are created with hot-melt rollcoaters and feedthrough roller presses. Certain grades can also be postformed and membrane pressed. MDF is the recommended substrate for best surface quality. Use is increasing in upscale, contemporary kitchens, as well as in retail environments. Most suppliers can offer small quantities, allowing economical access to a wide range of colors, woodgrains and other designs. Small scratches can be polished out. Printed paper foils, also known as light basis weight papers, are printed or solid-color dÃ©cor papers saturated with a blend of resins engineered for the final application of the paper. They may also receive a thin top or a “finish” resin coat for additional performance characteristics. Printed paper foils are capable of providing high print fidelity and realism for woodgrains, in particular. Decorative foils are very thin, which means they can “telegraph” any imperfections in the substrate surface. MDF generally has a smoother surface than particleboard, although filler materials can be used for a finer finish. Some printed paper foils can be pressed onto panels machined with 3-D surface details to give the effect, for example, of a raised-panel kitchen cabinet door. These materials are often used to create mouldings to complement other materials, particularly TFM wall paneling. Printed paper foils are widely used in closet systems, RTA and home office furniture, often in combination with other materials like TFM and HPL, which are capable of higher wear and impact resistance. They are also used on ceiling panels, cabinet interiors and on drawer components.